The Tab bar displays tabs which are currently available for use; each tab is essentially a separate Files pane, viewing a specific location. The user may quickly switch from location to location simply by selecting the appropriate tab. Each tab has a (right-click) context menu. If more tabs are open than will fit on the tab bar (depending on current sizing of Explorer++’s window and other panes), a set of scrolling buttons are available, allowing you to scroll left or right to view/select other tabs which are currently not visible. The Tab bar may be extended to the full window width using an option. Hovering the mouse over a tab displays it’s true location, regardless of the tab’s title. Tab’s opened at virtual folders show their CLSID (class ID), Windows’ internal representation of their location. Practically, these CLSIDs are of no use, except to a programmer. double-clicking empty space on the bar. This opens a file displaying the default contents. from the tab’s context menu. The tab need not be the current (ie. selected) tab. Be careful closing tabs - the current tab may not be visible! A tab closed in error must be re-opened and re-configured, as necessary. Files and folders in a tab’s file view (ie. the Files pane) may be moved from one folder to another simply by dragging and dropping them onto a tab. If you pause slightly before dropping the items onto the tab, that tab will become active, but this is not necessary in order to complete the move. This item opens/creates a new tab on the tab bar, but duplicates the tab from which this item was called. Placement of the tab is dependent on an option setting. Duplicating a tab does not duplicate it’s location history. 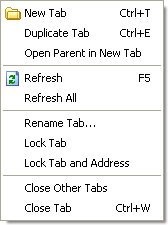 This item opens/creates a new tab on the tab bar, using the location of the current folder’s immediate parent. This is the folder that houses the current folder. The Desktop has no parent; this operation will not open a new tab if the current location is Desktop. This item performs a refresh on all tabs currently open. Ordinarily, a newly created tab assumes the name of the actual folder it displays (minus the drive and path information). This item, however, allows you to rename the tab to something more suitable to your needs. For example, while working on a programming project, you may have a tab open at “C:\Project\today\revisions\code”, but other folders of the name “code” may also exist for that project (eg. different versions, dates). You can rename the folder to “Today’s code” by selecting this item, choosing “Use custom name:” and typing in “Today’s code”. Renamed tabs are persistent, that is, they will remain renamed even during other sessions. On first opening the Rename Tab dialog, the “Use custom name:” setting is always selected as a convenience; it is assumed that you want to set a custom name. This item locks the tab, preventing it from being closed. The tab’s icon is changed, and the menu item becomes checked, reminding the user that the tab is locked. Locked tabs can still be re-arranged or renamed. Locked tabs must be manually unlocked to restore default behavior. Tab locked status is preserved between sessions. This item locks the tab, as above (ie. can’t be closed), but also prevents the address from being changed by double-clicking on a folder or drive. A new tab is opened instead, displaying the desired new address. This item closes all tabs on the Tab bar except the tab whose context menu you are using, even if that tab is not active. Of course, when all other tabs are closed, the remaining tab becomes active.